Trekking in the Fann Mountains is a truly spectacular experience. 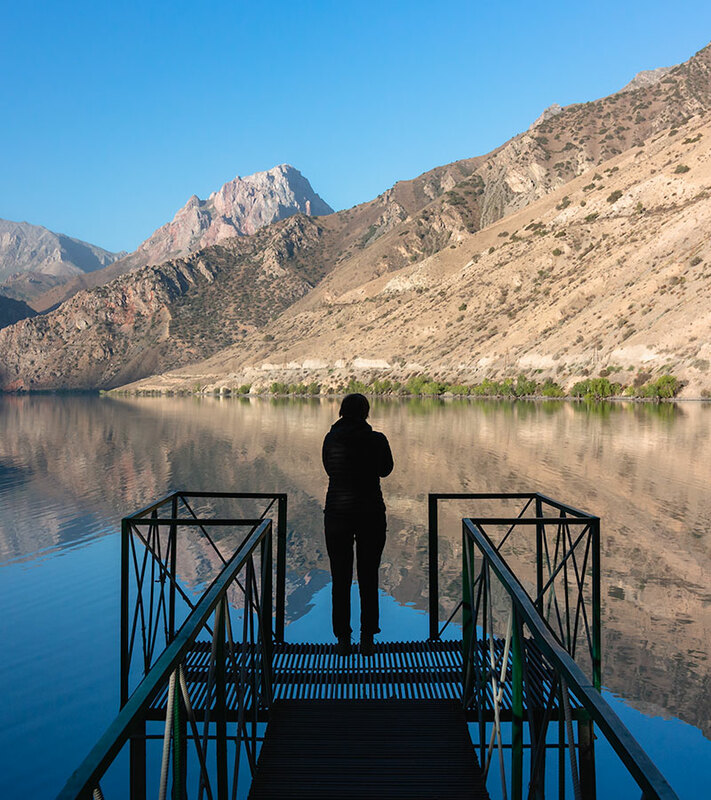 Some of Tajikistan’s most jaw-dropping scenery awaits those ready to explore on two feet. 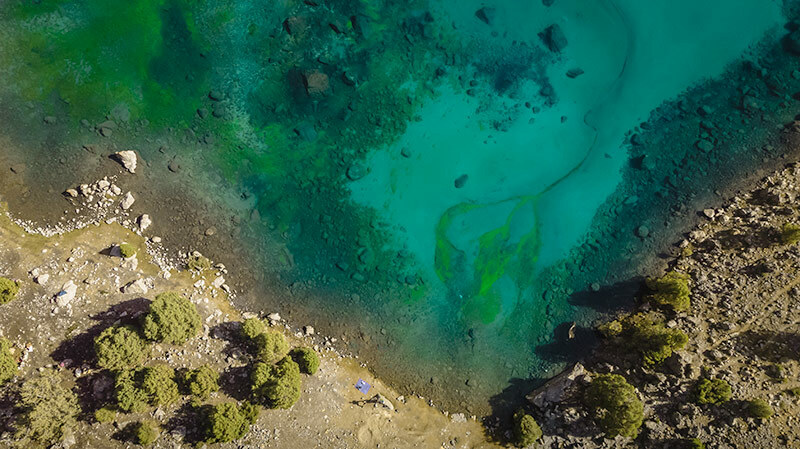 Impossibly blue lakes shimmer below dramatic mountain peaks. Welcoming locals beckon you in for chai multiple times a day. Juniper forests punctuate dry, dusty trails. Whether you visit for a day, week or month, the sense of awe felt in the presence of such dramatic landscapes is hard to shift. 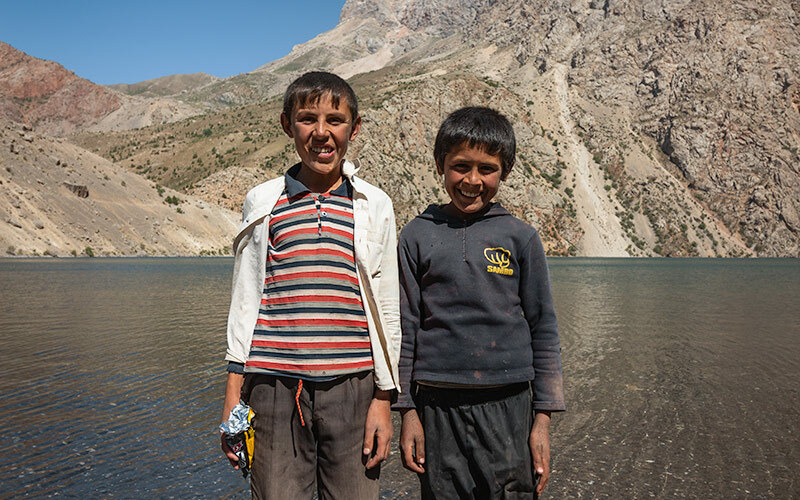 Tucked away in the north-western corner of Tajikistan, the Fanns are remote enough to be unheard of by many, yet easily accessible to those with an intrepid nature. With around a hundred peaks, numerous lakes, plus countless villages and seasonal settlements, it can be hard to know where to start when planning your Fann Mountains trek. Researching our own multi-day hike took considerable effort, piecing together bits of information from multiple sources and cross-referencing them with various maps. Throw in the confusion caused by a lack of standard English translation for place names and you’ve got quite the headache! Hence the need for this post. Our aim is to simplify the planning process for you, outlining a multitude of trekking routes, from easy two day tasters to challenging multi-day adventures. We’ve created a map of each suggested route, combining personal experience with information gathered from numerous other maps and written accounts. Switch between Google satellite and terrain views to fully appreciate the landscape. We’ve also marked camping spots and noted where homestays are available. We hope these help you to visualise the main Fann Mountains trekking trails better than a list of place names ever could. Regardless of your level of experience or time available, we’re sure there’s a Fann Mountains trek to suit you. In this guide we’ll help you figure it out, as well as give advice on all the practical stuff like what to take, how to get there and when to go. While we’ve tried to be as accurate as possible with the map routings, don’t rely solely on these for navigation. Be sure to cross-reference them with the excellent EWP Fann Mountains map, Maps.Me (iOS/Android) and any other mapping devices you have available to you. 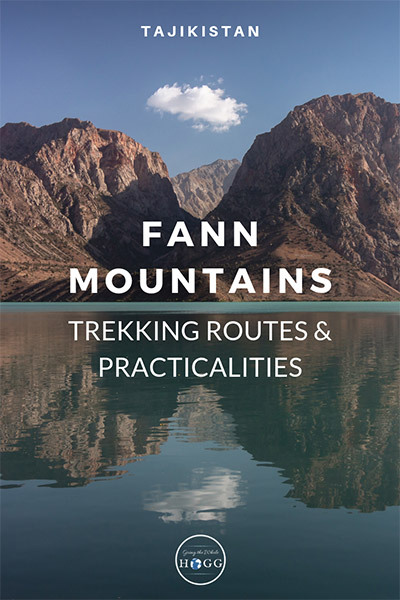 This list of Fann Mountains trekking routes is by no means exhaustive (you just have to look at the EWP map to see the endless number of passes and trails out there!). There are various other passes and alternative routings. We’ve covered the main trekking routes in this guide. The number of days/nights outlined for each trek is the minimum time it takes to cover the distance. It doesn’t include getting to/from the Fanns. Be sure to factor in an extra couple of days either side for travel. 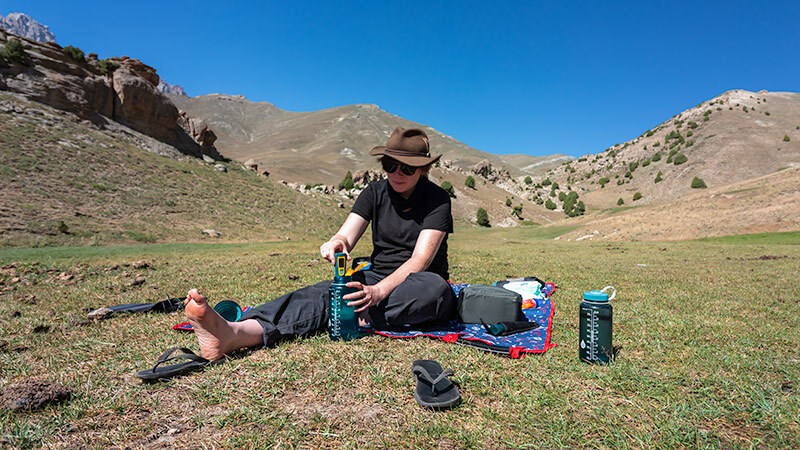 It’s also entirely possible to spend longer on each trek, for example camping a few extra nights around Kulikalon, relaxing in homestays in the Haft Kul, etc. Read through the whole guide, or jump to a particular section by clicking the links below. Boasting numerous high altitude lakes of dazzling blues and greens, Alauddin and Kulikalon are the highlight of the Fanns for many. Both areas are only accessible on foot, although there is road access to an old Russian climber’s camp a couple of kilometres away from Alauddin Lake. This makes it ideal for those short on time, but determined to experience the beauty of the Fanns. If you have longer to explore, the two areas can be combined into one circular trek, or a one way route. The English spelling of place names varies a lot. For example, Alauddin is also commonly spelt Alaudin or Alovaddin. Bibidzhonat also appears as Bibijonat or similar. Dushakha is sometimes written Dushoka, Mutnyi appears Mutnoe, etc. A straightforward and easy hike, but highly rewarding in the scenery stakes. Start your hike at the old Russian climber’s camp, Vertical Alauddin. After a couple of kilometres of gentle climbing past a few smaller lakes, you’ll reach the magnificent Alauddin Lake. A couple of chaikhanas at the north shore serve food and drinks. The best camping is at the green patch of flat (ish) ground on the south-west shore. Pitch up your tent for the night and head back down to Vertical the following day. 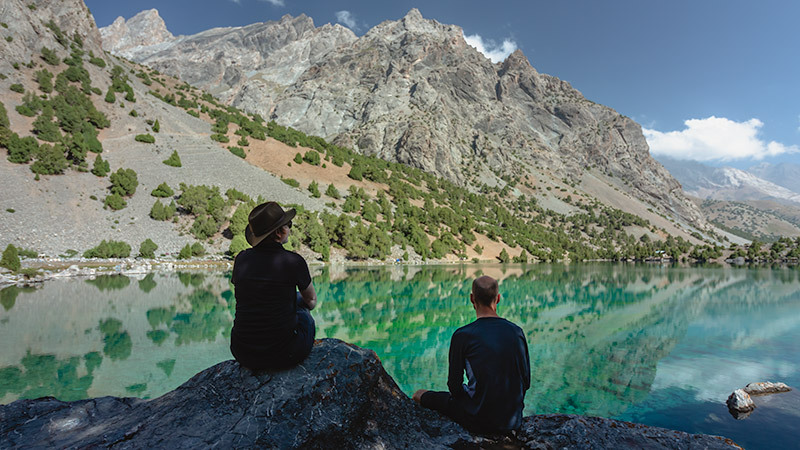 If you’re looking to stay a little longer you can add on a day hike to Mutnyi Lake and back (around 12KM total), or just explore more around Alauddin. If you don’t want to camp you could head back down to Vertical the same day where limited accommodation and basic toilet facilities are available. Numerous lakes dot the area around Kulikalon, each offering something special. Kulikalon itself is the largest and has multiple camping spots. A few herder families live nearby so don’t be surprised if you’re invited for chai and yoghurt. Bibidzhonat, a little further up the trail, has great views of Mt. Mirali. Dushakha, the highest of the three main lakes at around 3000m, sits at the very foot of icy Mt. Mirali. 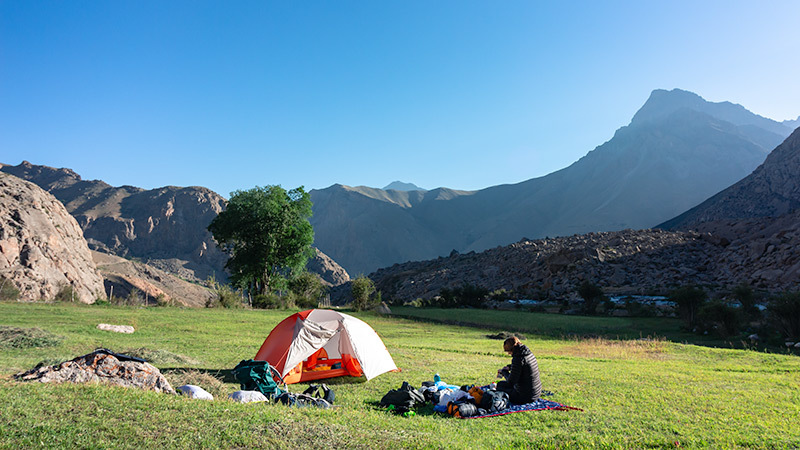 It was one of our favourite camp spots while trekking the Fann Mountains. If you’re only camping one night you’ll need to choose between them, but if you’ve got time to spare then relax and spend a night at each! Retrace your steps to Artuch on the return journey. Read our account of this section of the trail here. Accommodation is available at Alplager Artuch (also called Artuch Base Camp), but you’ll need your own tent and supplies for camping at the lakes. This is a great option if you want to see both Kulikalon and Alauddin Lakes, but have limited time. Opt for the Alauddin Pass for the best views and shortest trekking route. You could do the trek in either direction. Accommodation is available at Alplager Artuch and Vertical Alauddin, but you’ll need your own tent and supplies for camping at the lakes. This classic Fann Mountains trekking route takes in the best of the lakes region, without having to retrace your steps too much. It also has the benefit of starting and ending at Artuch which is relatively easy to get to via shared or private transport. You can opt to hike clockwise or anti-clockwise. Accommodation is available at Alplager Artuch, but you’ll need your own tent and supplies for camping at the lakes. Chimtarga peak is the highest in the Fann Mountains and a crossing of the Chimtarga Pass offers spectacular views and an added challenge to your trek. It’s advisable to cross from the Mutnyi Lake side as loose scree on the Bolshoi Allo side of the pass makes for an easier descent than ascent. At 4740m, this is the highest pass in the Fanns and shouldn’t be attempted unless you’re fully acclimatised and relatively experienced. Pay close attention to the weather also and only cross if you have a clear weather window. It’s considered a challenging pass, but doesn’t generally require technical skills. It can be covered in snow at any time of year, however crossing in July – August is likely to be snow-free. 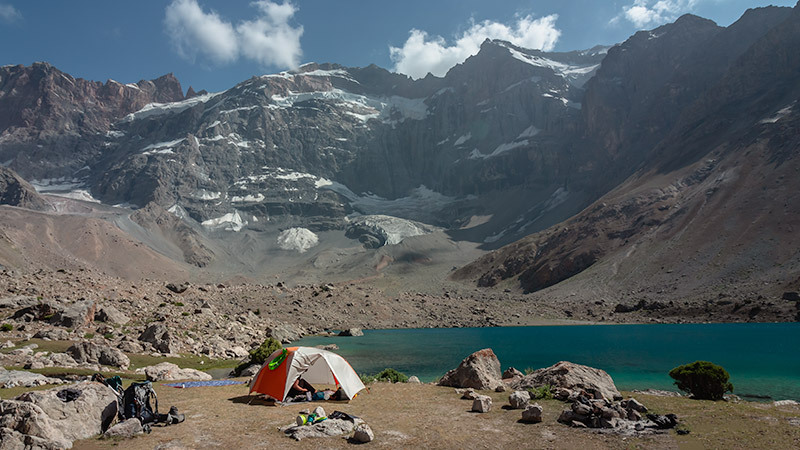 For acclimatisation purposes most people camp at Mutnyi Lake (3400m), then at a flat spot under Chimtarga Pass at 4500m (or lower at a 4100m camp). Then it’s over the pass and down to Bolshoi Allo Lake (3360m) the following day. 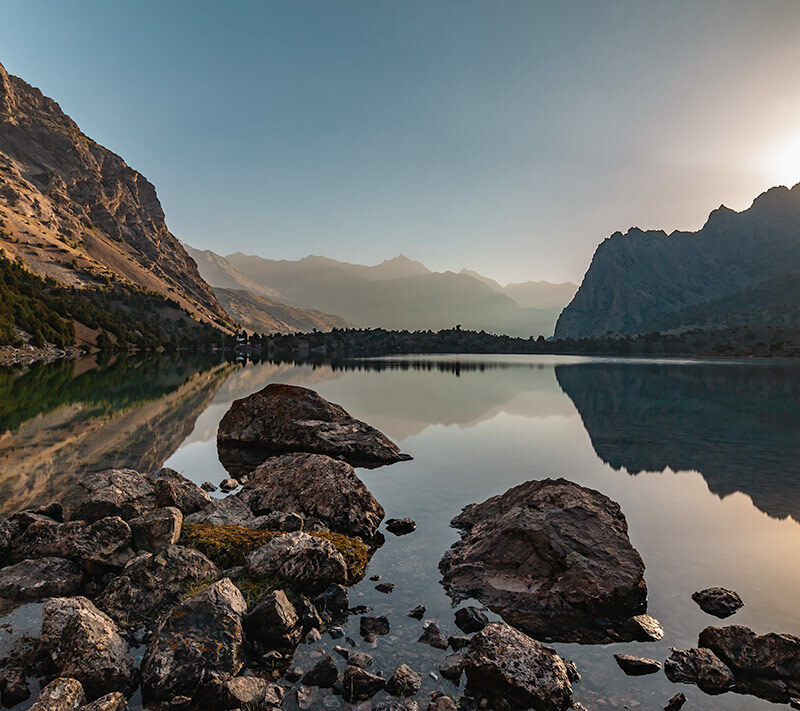 Bolshoi Allo is considered one of the most beautiful lakes in the Fanns and worth spending a bit of time relaxing at, especially after the strenuous crossing. Therefore, in our suggested trek itineraries the next camp spot is at a small lake called Maloye Allo, around 6 km west of Bolshoi Allo, down the Zindon river valley. This allows you to spend a relaxed morning at Bolshoi Allo, without too long a walk ahead of you. Continuing down the Zindon river you’ll meet the Amshut river and eventually the Archamaidan. Here you’ll find a road to continue the trek north towards the villages of Gazza, Zimtut, Guitan and beyond, or south towards the confluence of the Sarymat and Archamaidan rivers. From the confluence you can trek south-west to the Haft Kul via Tavasang Pass or south-east to Iskanderkul via Dukdon Pass. For an interesting account of crossing Chimtarga Pass, check out this post, accompanied by stunning photos. 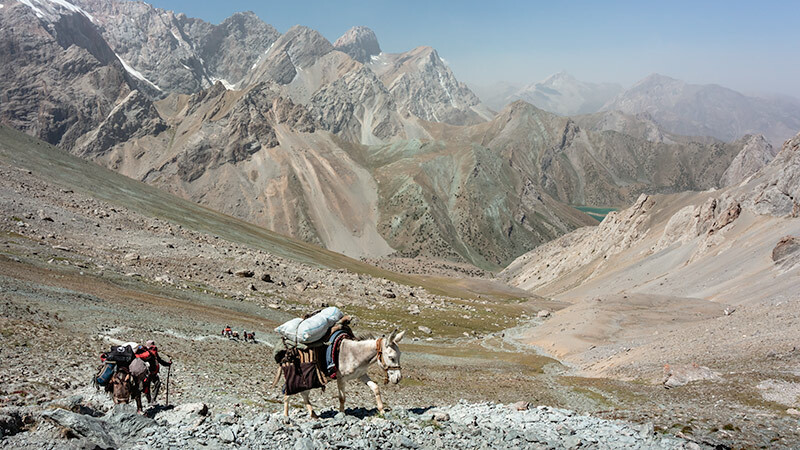 Note that pack donkeys cannot cross the Chimtarga Pass, so you’ll need to carry your own gear. It’s straightforward enough to combine the lakes of Kulikalon and Alauddin with a trek over the Chimtarga Pass, provided you have enough time. You can make a circuit from Artuch, or shave off a couple of nights by finishing up in Zimtut and taking transport out from there. This circular trek takes in the highlights of the lakes region, plus the Chimtarga Pass and the chance to experience village life in the Archamaidan Valley. You’ll camp by the shores of multiple high altitude lakes, cross three high passes and trek through a variety of landscapes. This trek is best suited to those with experience (especially if planning to trek independently) due to the length and altitude gained. Once you reach the road section in the Archamaidan valley you have a couple of options for getting to Chukurak Lake. You can continue all the way to Zimtut and climb the switchback road to Guitan. Here you can sleep in a homestay before crossing the Igrok/Guitan Pass (2600M) to Chukurak Lake. Or, head east a few kilometres after Gazza towards the Zurmech Pass (3260M). Camp by the river before crossing the pass and descending to Chukurak Lake the following day. When we passed the turn off for the Zurmech Pass in August 2018 the bridge across the Archamaidan had collapsed, making the Guitan/Igrok Pass the easier choice all round. If anyone has an update on the status of this bridge, leave a comment below so we can amend this info! Accommodation is available at Alplager Artuch and homestays are possible at Gazza, Zimtut and Guitan villages. For the rest of the trek you’ll need your own camping equipment and supplies. This is a shortened version of the Chimtarga Loop, finishing at Zimtut instead of continuing to Chukurak Lake and back to Artuch. There are homestays available in Zimtut and you can arrange transport out to Panjakent or elsewhere. 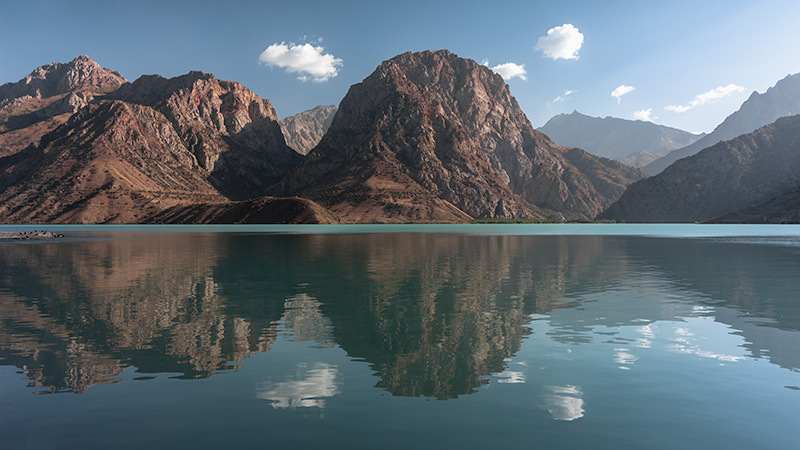 The Haft Kul, or Seven Lakes to give it its English translation, is a string of lakes in the western region of the Fann Mountains. With each lake the scenery becomes ever more spectacular, dramatic mountains rising either side and picturesque villages dotting the valley. There is a motorable road all the way to the end of the 6th lake, with the 7th lake accessible on foot. For those short on time or less keen to actually hike in the Fanns, this area is perfect as you can drive all the way to the end of the 6th lake, with the 7th lake just a short hike uphill beyond. If you’d rather explore on two feet then arrange private transport or take a shared taxi as far as Rasima Village, the last village before the 1st lake (or any other village along the way!) and hike the rest of the way up the road. Homestays are available at Nofin village, by the 4th lake, and Padrud village between the 4th and 5th lakes. The best spot for camping is by the northern shore of the 7th lake. It’s possible to combine both the Haft Kul and The Lakes into one trek, crossing the Fanns from the west to the north or vice versa. This was the option we settled on for our first Fann Mountains trek, described in this post. This is a good option for those wanting to explore more of the Fanns, taking in highlights like the Seven Lakes, Kulikalon and Alauddin, as well as local villages and river valleys. This route requires a good level of fitness and some trekking experience, but avoids the most challenging passes. 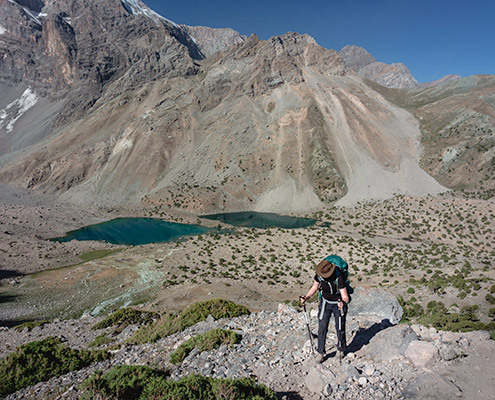 After making your way to the Haft Kul (and possibly camping at the 7th lake the night before) start your trek from the 6th lake, heading east towards the Tavasang Pass (3250M). After crossing the pass, camp at the meadow below before continuing your descent to the Sarymat river the following day. You’ll pass local herders and seasonal homes on the way, the friendly locals no doubt inviting you to sit for chai and yoghurt. Continue down the Sarymat river until reaching its confluence with the Archamaidan river, a stunning spot where you can set up camp for the night. From here the trek continues on a motorable road north towards the villages of Gazza and Zimtut. Walk all the way to Zimtut, where you can stay at a homestay, or take the alternative route towards Zurmech Pass (as described above in the Chimtarga Loop trek outline). The following morning zig-zag your way up the road to Guitan, then continue up and over the Igrok/Guitan Pass (2650M). Descend through the juniper forest to Chukurak Lake, setting up camp by the shore. Head down to Alplager Artuch to stock up on supplies the next day, then ascend to Kulikalon and pick a camp spot by the stunning lake. Alternatively, continue on a little further up the trail to Bibidzhonat or Dushakha and camp there. 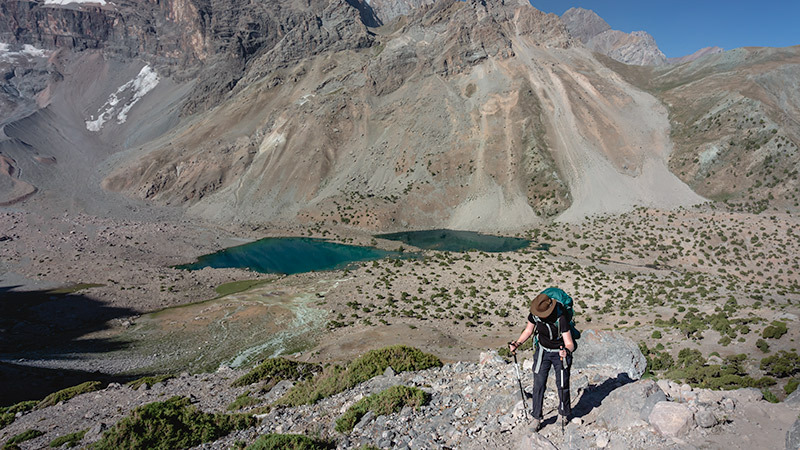 The following day climb the Alauddin Pass (3860M) and admire the incredible view over Alauddin Lake below, before descending and camping by its shore. Don’t miss the sunrise reflections in the lake the next morning. Once you’re packed up it’s just a short walk down to Vertical Alauddin where you can arrange transport to Sarvoda or beyond. Accommodation is available at Alplager Artuch and Vertical Alauddin. Homestays are available at Nofin and Padrud villages in the Haft Kul and Gazza, Zimtut and Guitan villages in the Archamaidan valley. For everywhere else you’ll need a tent and supplies. 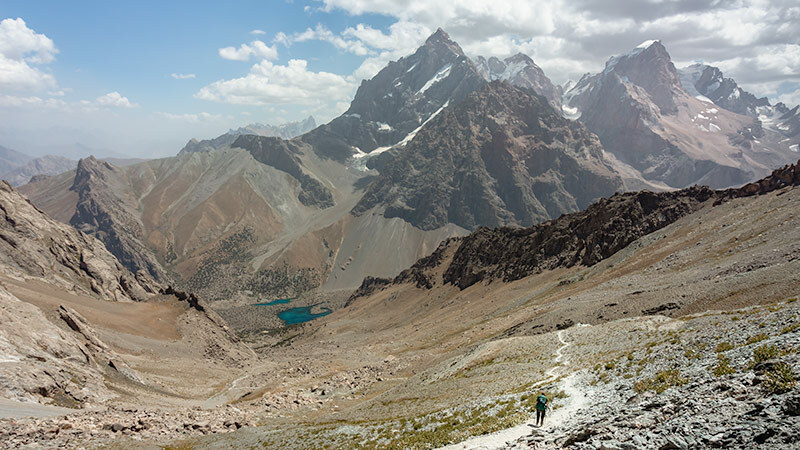 For a more challenging trek, combine the Chimtarga Pass into your route along with the Haft Kul and Lakes regions. You’ll explore the best the Fanns have to offer, camp next to magnificent lakes, and pass through many villages and seasonal settlements. These treks cover a fair distance and reach up to 4740M in altitude, so be sure you’re well acclimatised, in good shape and have reasonable trekking experience before embarking on one of these routes. An extensive trek, covering all the highlights of the region. Follow the outline of the ‘Haft Kul to Vertical Alauddin’ trek, heading south from Alauddin Lake to Mutnyi and beyond to Zimtut as outlined in the ‘Chimtarga Loop’ trek. A shortened version of the above ‘Fann Mountains Explorer’ trek, skipping Chukurak Lake. It’s best to start at Artuch/Alplager and end at Haft Kul in order to approach the Chimtarga Pass from the Mutnyi Lake side. Accommodation is available at Alplager Artuch and Vertical Alauddin. 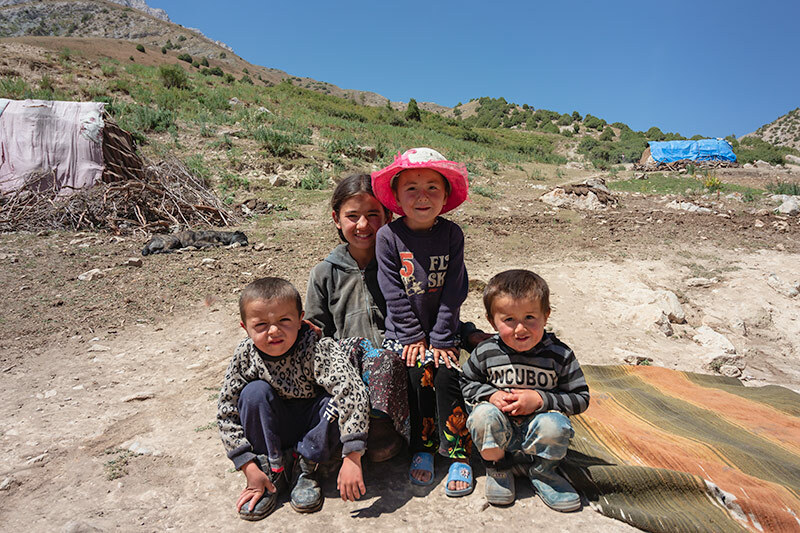 Homestays are available at Nofin and Padrud villages in the Haft Kul. For everywhere else you’ll need a tent and supplies. An alternative shortened version, skipping Chukurak and Kulikalon Lakes, starting instead at Vertical Alauddin. Accommodation is available at Vertical Alauddin. 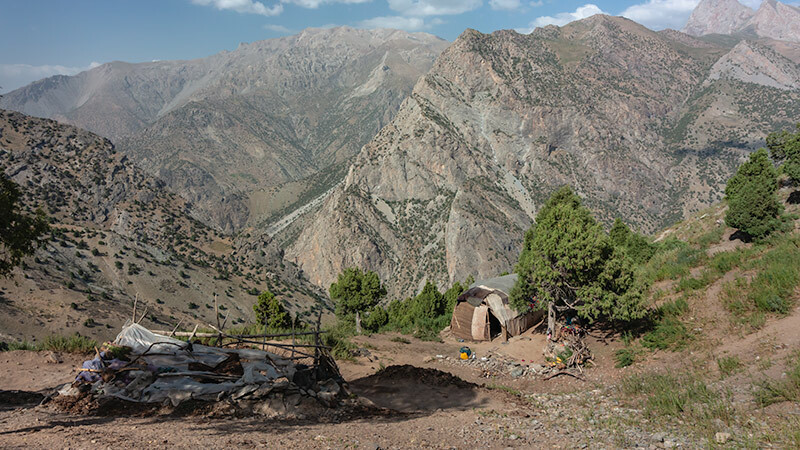 Homestays are available at Nofin and Padrud villages in the Haft Kul. For everywhere else you’ll need a tent and supplies. 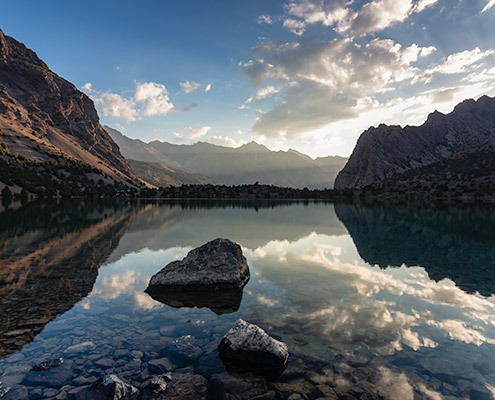 Iskanderkul is perhaps the most famous lake in the Fann Mountains, dominating the south-east of the region. 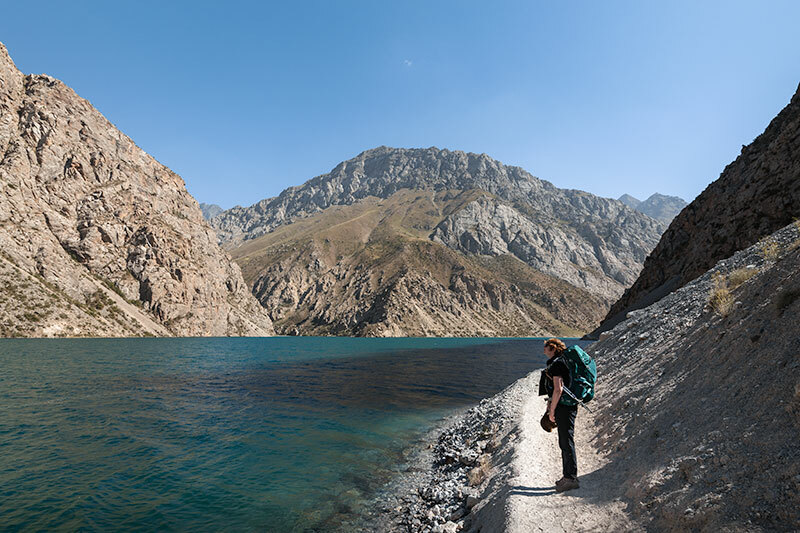 While there are a number of day hikes around the lake, it’s also possible to trek between Iskanderkul and the Haft Kul. This is commonly referred to as the West-East Traverse, via the Dukdon Pass (3810M). Like many trekking routes in the Fanns, the trails follow traditional herder routes and you’ll encounter plenty of locals, villages and summer settlements along the way. There are a number of streams to ford on the western approach to the Dukdon Pass, so you’ll need to be comfortable with this. Although we’ve outlined the below treks from west to east, you could trek in either direction. 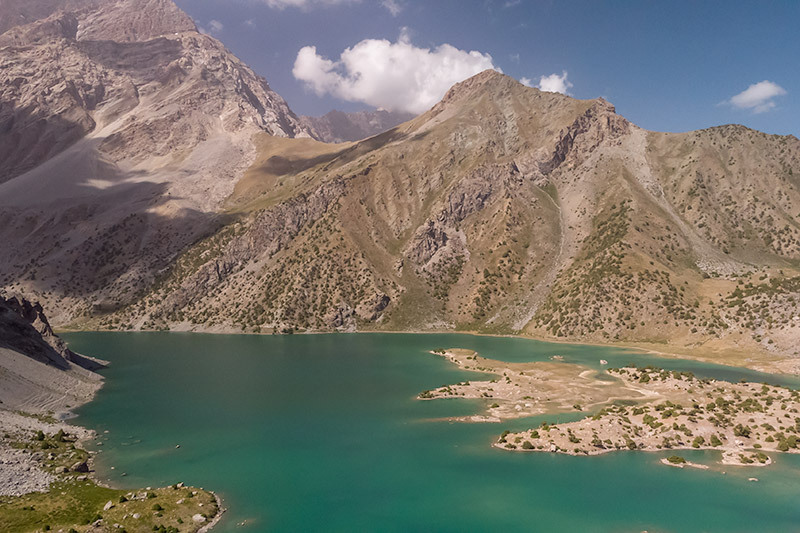 The start/end points are the 6th lake in the Haft Kul, and Sarytag Village south-west of Iskanderkul. You could also add in a side trip to Pshtikul Lake on the way up the Archamaidan valley. 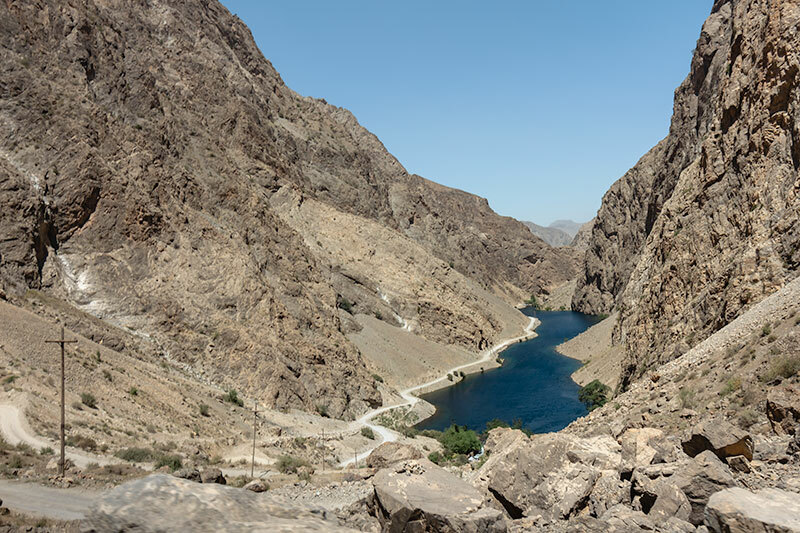 Drive or hike up the Haft Kul and head east from the 6th lake all the way to the confluence of the Sarymat and Archamaidan rivers, following the route outlined in the ‘Haft Kul to Alauddin’ trek above. From here you’ll head south-east following the Archamaidan river up towards the Dukdon Pass. This section has a few streams you’ll need to ford as there aren’t bridges. There’s a camp spot at the foot of the pass at 3010M. The following day head over the pass and down the steep scree slopes towards the confluence of the Dukdon and Karakul rivers. 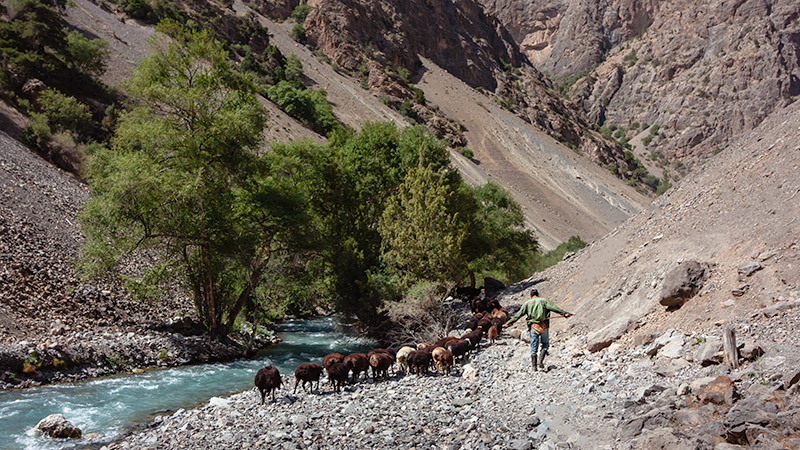 Follow the Karakul river east to Sarytag Village and Iskanderkul. 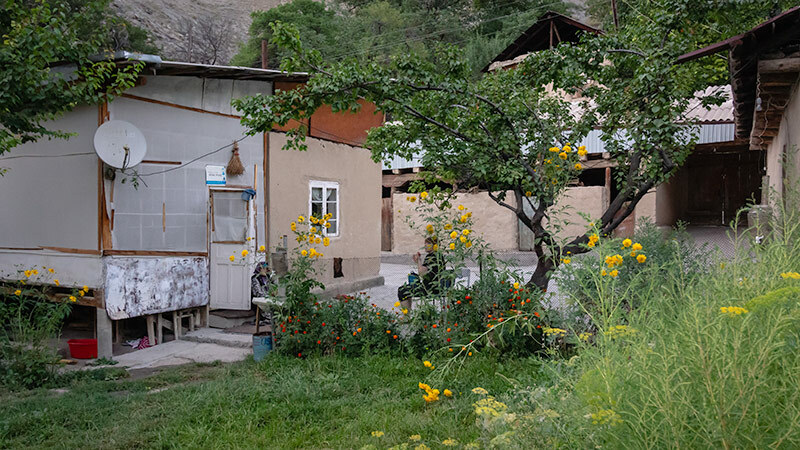 There are homestays available in Nofin and Padrud villages in the Haft Kul, and Sarytag Village south-west of Iskanderkul. There is a paid campground and old Soviet Turbaza (holiday camp), plus more homestays, on the northern shore of Iskanderkul. Elsewhere, you’ll need your tent and supplies. This longer variation on the West-East Traverse crosses the Munora Pass before descending to the Archamaidan Valley and heading south-east over the Dukdon Pass to Sarytag. Follow the outline of the trek from the 6th lake over the Tavasang Pass and down to the Sarymat River. When you reach the Sarymat, double back and head south for a couple of kilometres before crossing the river and heading east along the Abusafedsoi River. There’s a camp spot a little further up the river. The following morning head over the Munora Pass (3520M) and descend to the Archamaidan River. Follow the river west until you come to a bridge and cross to the north side, then head east again. There are a few possible camp spots along the river, or carry on all the way to the foot of Dukdon Pass camp marked on the map. The following day cross the Dukdon Pass and head south-east towards Sarytag. Depending on where you camped the previous night you may walk all the way to Sarytag today (18KM from the foot of Dukdon Pass camp, meaning you complete the trek in 3N/4D). Otherwise, stop to camp after crossing the pass at 3400m, or continue to a camp spot at the junction with the Karakul River. On day 5 continue east to Sarytag Village, or all the way to Iskanderkul itself. Our final Fann Mountains trekking route suggestions combine the spectacular lakes of the northern region with Iskanderkul in the south. We outline three trekking routes, of varying degrees of difficulty. The least challenging of the three routes linking The Lakes with Iskanderkul, this trail could be tackled in either direction. 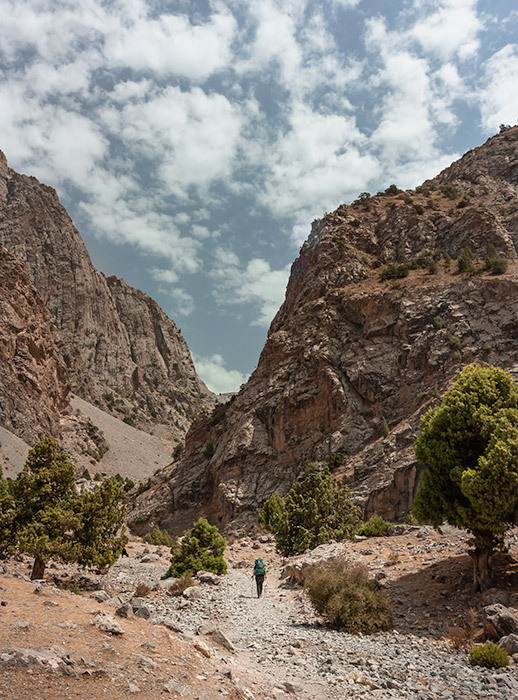 Starting at Vertical Alauddin, follow the outline (previously given in reverse) of the trek between Vertical and the confluence of the Sarymat and Archamaidan Rivers in the ‘Haft Kul to Vertical Alauddin’ trek. From the confluence, head south-east following the route outlined in the ‘West-East Traverse via Dukdon Pass’ trek, all the way to Sarytag Village. Accommodation is available at Vertical Alauddin and Alplager Artuch. Homestays are available at Guitan, Zimtut and Gazza villages in the Archamaidan valley and Sarytag Village south-west of Iskanderkul. There is a paid campground and old Soviet Turbaza (holiday camp), plus more homestays, on the northern shore of Iskanderkul. For everywhere else you’ll need camping gear and supplies. This trek takes on the highest pass in the Fanns, Chimtarga Pass, as well as many of the most beautiful lakes in the region. As previously mentioned, it’s best to tackle this route from north to south in order to approach the Chimtarga Pass from the least difficult side. 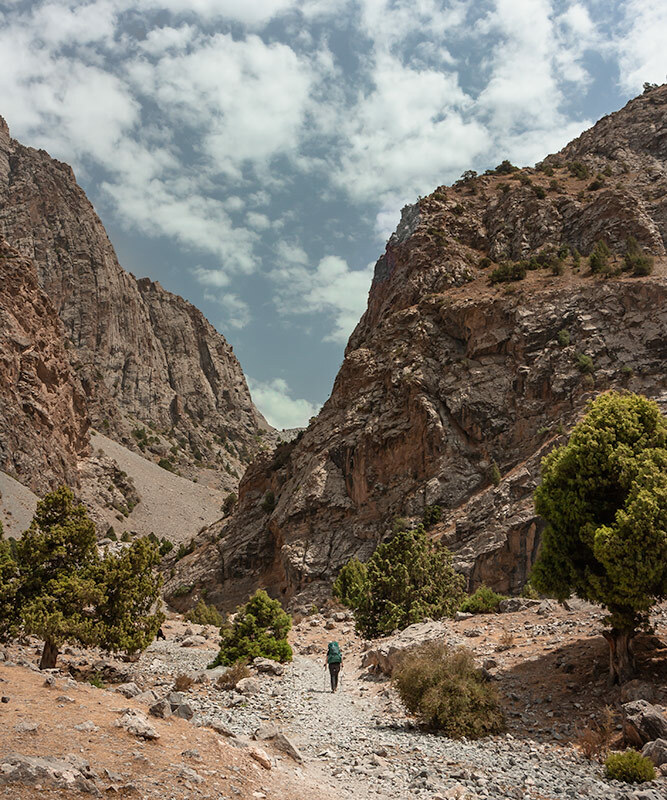 Follow the outline given in the ‘Artuch to Haft Kul via Chimtarga Pass’ trek from Artuch/Alplager to the confluence of the Sarymat and Archamaidan Rivers. From there, follow the route outlined in the ‘West-East Traverse via Dukdon Pass’ trek all the way to Sarytag Village. Accommodation is available at Alplager Artuch. Homestays are available at Sarytag Village south-west of Iskanderkul. There is a paid campground and old Soviet Turbaza (holiday camp), plus more homestays, on the northern shore of Iskanderkul. For everywhere else you’ll need camping equipment and supplies. 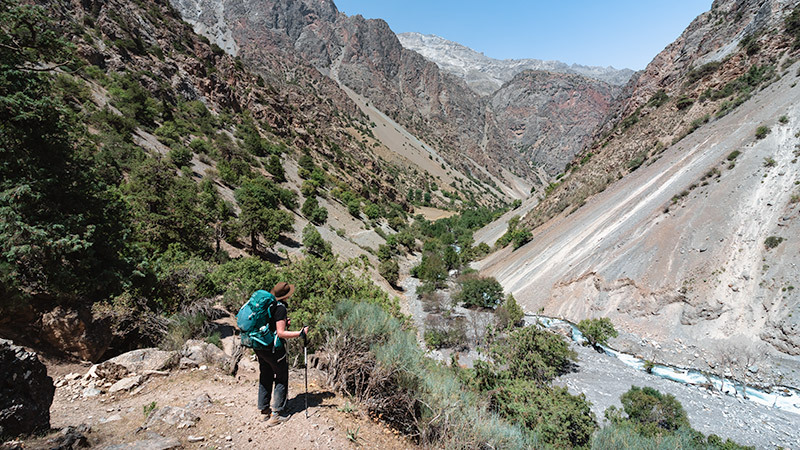 This is the shortest route between The Lakes and Iskanderkul, however it is also the most challenging and technical. The Kaznok Pass is covered in ice on its northern slope, meaning crampons and an ice axe are required year round. It’s advisable to trek from north to south. Starting at Artuch or Alplager trek up to Kulikalon, over the Alauddin Pass to Alauddin Lake and up to Mutnyi Lake (you could also start at Vertical Alauddin if you wanted to shave off a day). From here head south, up and over the Kaznok Pass East (Kaznok Vostochny) (4040M) and descend to a camp spot by the Upper Kaznok River. We’ve marked two camping possibilities on the map. The following day continue following the Kaznok River all the way south to the Sarytag river, heading east for the final stretch to Sarytag Village. 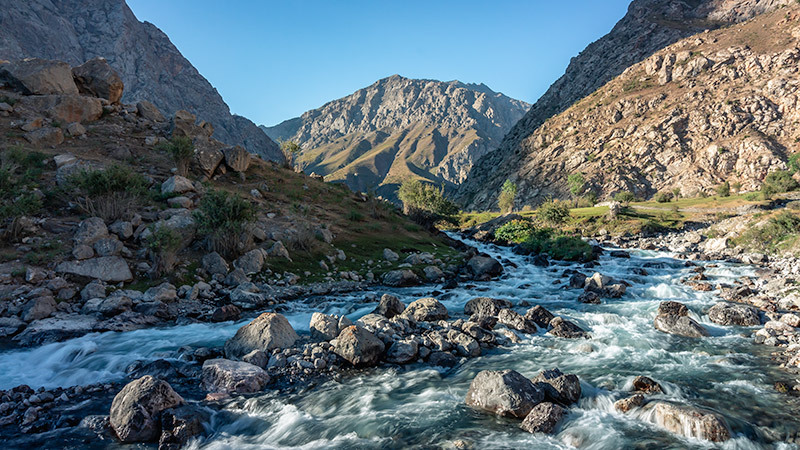 The best time to trek is during the Tajik summer in July and August, although the season is generally considered to be mid-June to mid-September. Outside of this period there is likely to be snow on the high passes, making them difficult to cross or impassable entirely. In springtime and early summer river levels are high, making stream and river crossings more dangerous, or impossible. The amount of food, camping equipment and trekking gear you pack will very much depend on your Fann Mountains trekking itinerary, and whether you trek independently or as part of an organised tour. If you plan to trek independently you’ll need to be completely self sufficient, carrying camping gear and food supplies for the duration of your trek. If you trek as part of an organised tour then your camping equipment and food will most likely be taken care of. You’ll trek with a day pack, the rest of your luggage being carried by pack donkeys. Below, we’ve compiled general packing lists for any kind of Fann Mountains trek, plus extra advice on what to take for independent treks. You need to be prepared for all weather conditions and eventualities. Quality gear and the right materials will make a big difference to your enjoyment and how much/little you need to pack. Layers are important – you need a baselayer (like this), a mid-layer (like this), an insulating layer (like this), plus a top shell (like this). Avoid cotton – opt for merino wool instead. It keeps you cool when it’s hot and warm when it’s cool, and amazingly won’t stink even after days of wearing it. It will dry relatively fast too. Make sure you have a separate change of clothes for the evening/sleeping in and get out of those sweaty clothes as soon as you arrive at camp. Changing your clothes, including your socks, will keep you much warmer. Break in your hiking boots before your trek! Blisters and hot spots can really ruin your hike. Pack Compeed or similar just in case. You might lose weight on the trek! Osprey backpacks with their Anti-Gravity (AG) back system are the most comfortable and easy to carry we’ve ever used. We highly recommend them! If you’re trekking independently you’ll need a backpack of at least 60L for shorter treks, and up to 80L for longer treks. If you’re joining a supported trek a day pack will suffice. Check with your trekking company in advance to find out the best kind of bag to bring for the rest of your luggage. A duffel bag may be easier to pack onto your donkeys than a traditional backpack. We couldn’t have managed our Fann Mountains trek without them and met plenty others of the same opinion. Cork handles are by far the best when it comes to hot sweaty palms and carbon fibre will help you keep the weight down. After much deliberation we chose these poles and they’ve done us proud on countless trails now. Order the EWP Fann Mountains map before you leave home. You’re highly unlikely to find it in Tajikistan. It’s the most detailed and useful paper map out there, plus it has a wealth of information about the area, local customs and more. We used this to plan our route in advance, and in conjunction with Maps.Me while we were actually trekking. While this isn’t an essential to have if you’re trekking with group tour, you may still want to have it with you for reference. There’s nowhere to charge your devices other than homestays, so you’ll need this to keep everything working! It folds up small and light and can attach to your bag if you want to use it on the go. It works perfectly for us, charging everything apart from our laptop and drone batteries. There’s no shortage of water on the trek, but you’ll need to treat it before drinking. There are numerous ways of doing this, like purification tablets, pumps, squeeze filters or a LifeStraw. Our personal favourite is the Steripen. Used in conjunction with their filter this gives us pure water that is sterilised by UV light, killing any harmful bacteria. It’s really quick and easy to use, requiring minimal effort. We can recharge the battery via USB using our solar panel every few days. (We use this day in day out everywhere we go on our travels, not just when trekking. It’s been a huge backpacking game changer for us and we’ve more than made back our money on it!). It’s useful to have a water bottle for around camp and filling up at streams. We love our Nalgene Tritan Wide Mouth bottles. They’re see-through and have markings down the side, making it easy to judge how much water you’re drinking (and staying hydrated is extra important at altitude). Easy to carry and use, they go everywhere with us these days. For easy drinking on the go. Fill up your bladder with treated water and stick it in your daypack, the hose threading through a dedicated hole in your pack so you can drink without having to stop and take out your water bottle. We’ve tried a few, our latest Hydrapak winning hands down for ease of use and cleaning. You can use it as a water reserve around camp too. Even with the best no-stink merino wool T-shirts, you’re still gonna need to do washing at some point. 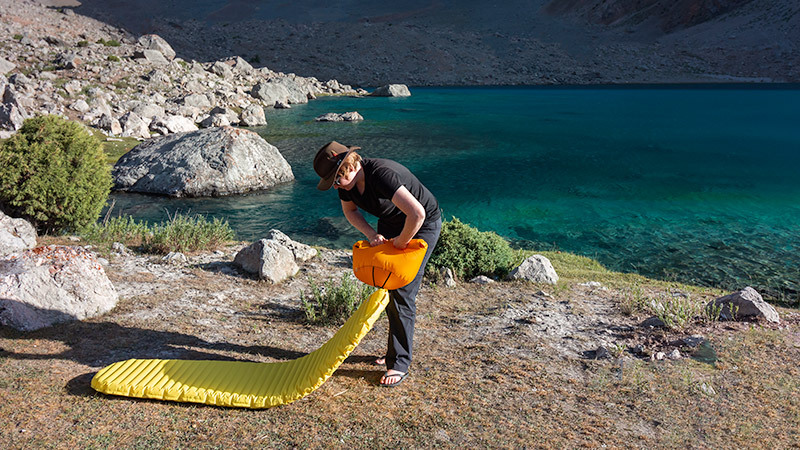 The Scrubba is a genius solution to doing laundry on the go and ideal for any longer Fann Mountains trek. Collect water from a river or lake, add biodegradable suds and rub away. Empty out the soapy water away from your water source and rinse with fresh water. Drape your clothes over a nice rock, or string them up to dry. Do not pollute the local water supplies with soap! Be sure to empty out your soapy water away from lakes and rivers, even if it’s biodegradable. A must! We’ve had plenty, but finally invested in better quality ones and the difference is blinding. Literally. They’re so powerful. Our Black Diamond rechargeable models are perfect. For cloudy days or charging easily on the go. Anker are our preferred. Everyone has their favourite. I’ve never looked back since discovering non-greasy Banana Boat. A stick for your lips is important too. Some camp spots have annoying horse flies or other bugs. It’s imperative that you dispose of your human waste properly when trekking in the Fann Mountains (and anywhere else for that matter!). There are no toilet facilities outside of homestays and established camps like Vertical or Alplager Artuch. Therefore you need to dig yourself a hole around 4-6 inches deep, at least 50m away from any water source, and cover it up again when you’re done. A pocket trowel is ideal for this. Don’t put your dirty toilet paper in the hole, either burn it or carry it out with you. Urine isn’t as hazardous as faeces, but avoid peeing in or near water sources. If you’re booking an organised trek be sure to question your trekking company on their toilet policy and find out in advance whether you need to bring your own trowel or if the company dig a latrine and designate one area as the camp toilet. If they don’t have a set policy on this and other rubbish disposal procedures, it’s a strong indication that they aren’t operating in an environmentally sustainable way. In this case you should reconsider trekking with them, as responsible tourism to the region is vital for the health of both the local communities and the landscape. For drying off after a rare shower or washing on the go. Much like with your laundry, be sure to wash away from water sources and don’t pollute any streams or lakes with soap, shampoo, etc. An all purpose one like this is ideal. It’s a good idea to add rehydration sachets in case of diarrhoea, blister pads, and some extra ibuprofen and painkillers. You can’t pick up any medical supplies on the trek, however there are plenty of pharmacies in Dushanbe. You’re going to be carrying it the whole way, and camping at relatively high altitude so weight and quality are important. We did a lot of research and in the end it came down to MSR’s Hubba Hubba or the Big Agnes Copper Spur for us. In the end, Big Aggy won on durability, plus the colour is better. We’ve been hugely impressed with our Thermarest NeoAir mats. They pack down way smaller than our previous Thermarest self inflating mats and are super comfortable and insulating. I was concerned about the ‘crisp packet rustling’ I’d heard about before buying it, but it’s really not that noticeable. Be sure to carry a puncture repair kit with you too. It can get pretty chilly camping at altitude, especially if you’re trekking outside of peak summer time. We had 3 season Rab down sleeping bags, comfort rated to 1.5 degrees celsius. Del wasn’t cold at any point, I was a bit cold at Dushakha Lake (and definitely cold when camping in September in Kyrgyzstan’s mountains). I’ve since upgraded to this sleeping bag and can highly recommend it. Down sleeping bags offer the best warmth to weight ratio, and can really pack down small. Using a compression sack will save even more space in your backpack. This will add extra warmth to your sleeping bag, or if it’s freakishly warm use it on its own. Some people roll up a fleece or such like. Personally I need a proper pillow to get a good night’s sleep. A blow up one like this saves space. The Fann Mountains are remote, wild, and located in an area prone to earthquakes, landslides and other natural disasters. There is no established mountain rescue service. Trekking here, as is the case anywhere, comes with a degree of risk and as such an emergency satellite communication device is highly recommended. We debated long and hard over whether to buy an InReach Explorer or not as it’s pretty expensive, but in the end our safety is more important to us than our bank balance. This SOS emergency device is capable of two-way messaging via the Iridium satellite network, providing us with a lifeline to a 24/7 emergency response team. There’s no mobile network coverage in the Fann Mountains, outside of a few select villages or base camps, so having something like this is your only way of communicating with the outside world. The only times we had phone signal were in Zimtut and at Alplager Base Camp near Artuch (we had T-Cell SIM cards). We also used our InReach to message family to reassure them we were safe, to get accurate weather reports, and as an extra GPS tracking device. Del planned out all our routes in advance via the Earthmate app, a third map source for us. You have to have an active contract to use the InReach, with monthly and annual options available. If you travel in remote areas regularly it’s a good investment. We use a simple screw-on burner like this, however something like the MSR Whisperlite Universal is far more versatile given the issues you’ll encounter sourcing fuel in this part of the world (see below). You can’t fly with gas canisters so you’ll need to pick them up in Tajikistan (or elsewhere if travelling overland). In Dushanbe you can usually buy them at Green House Hostel (also our recommended place to stay), but they can and do run out of stock! They import Kovea canisters (like the one in this picture) from Korea, charging 65 somoni for small (240g) and 95 somoni for large (450g). They were out of stock the second time we tried to buy gas. Fortunately we got a half-used canister from another backpacker who was flying that day. It’s not a bad idea to email them in advance and ask them to put stock aside for you if you have an exact arrival date. You’ll have a hard time finding screw on type gas anywhere else, hence why a multifuel stove is handy. 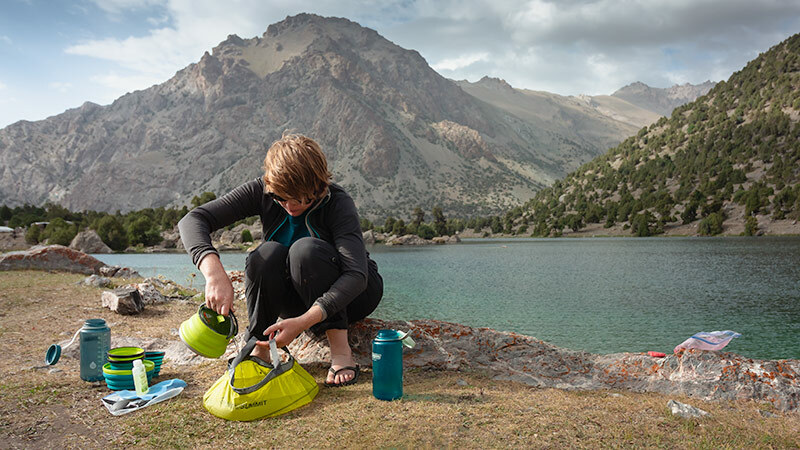 We’re loving our collapsible Sea to Summit cook set. It’s easy to clean and pack, and as lightweight as we’re likely to get. We also use the Sea to Summit kettle to boil water and X-Brew for making drip coffee every morning. Ours stack into our cooking pot as part of the above set. A cheap spork might be all you need. Ours have always broken though, so we’re using these instead which are more durable. Scrubber and biodegradable dish soap for washing your dishes. We have a Sea to Summit kitchen sink, which is good for doing dishes (and washing hair in!). You could also just fill the big pot from your cook set and use that as a basin. For putting all your stuff on and sitting on when it’s wet/dusty/dirty. If you’re on a supported group trek, all your food will likely be included. You may want to pack your own snacks though. If you’re trekking independently then you need to plan your food carefully in advance. You can buy non (bread) from local homes or chaikhanas throughout the Fann Mountains. Snickers and some basic supplies are available at bigger villages like Zimtut. At Alplager Artuch and Vertical Alauddin you can also eat at the restaurant. You shouldn’t rely on these sources though, be sure to have packed everything you need in advance. Remember, you must carry all the packaging back out with you, therefore cans, glass jars, tins, etc., are not a good idea. When shopping for food the aim of the game should be to pack as many calories for as light a weight as possible. You can stock up in Dushanbe, however we’d also highly recommend bringing dehydrated meals from home, at least enough to cover dinner every day. For everything else, the supermarket in Dushanbe Mall has the best selection. Below is some suggested food – all is available in Dushanbe unless otherwise noted. You can find a good selection of nuts, seeds, raisins, etc. in Dushanbe. Throw in some chocolate and peanut M&Ms and mix your own. Jam in a packet – perfect for adding to porridge in the morning or having with bread for lunch. You can get a small plastic tub instead of a glass jar. The locally grown dried apricots are especially good. Dates are another good energy booster. The Swiss brand (got a logo of a cow on skis) was our favourite. Others were very sweet. Bring from home. Good for adding to your water for an energy boost, especially on those long days with no shade when you’re sweating a lot. Cooks pretty quickly and is very filling. Mix in some dehydrated veggies from home and spices to jazz it up? A quick and easy option for a hot meal. We found some decent chicken ones with croutons. Transfer some into a small plastic bottle to carry. Makes hard bread far more edible. Good for frying some eggs or veggies if you buy some along the way. Also good for dry skin, sunburn, dry hair, etc. 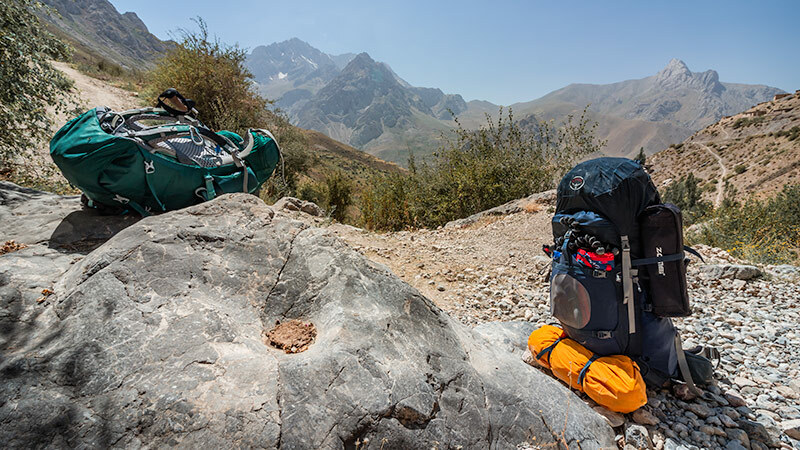 Be sure to check the inclusions of your travel insurance – not all policies will cover trekking at altitude! Depending on your trekking itinerary you’ll likely need cover for trekking above 3000m, and possibly above 4500m (this would cover crossing the Chimtarga Pass, for example). It’s wise to ensure you have Search and Rescue and Medical Evacuation cover included also. Check the exclusions of your policy carefully. For the full lowdown on choosing a policy check out this post. Whether you’re already travelling or not, get a quote now with World Nomads! If you prefer not to trek independently, or want to hire a pack donkey, there are a number of options. ZTDA is the local tourism association and they can arrange an English (or German/French) speaking guide for $35/day. A Russian speaking guide is $20/day. A pack donkey with handler is $20/day. You can also source guides through Indy Guide or Caravanistan (Caravanistan also have a good forum for meeting potential trekking buddies). A number of companies run fixed dated group trekking tours in the region. Kalpak and Paramount Journey are two of the main ones. You can compare various options easily via Tour Radar. Viator is worth checking too. Accommodation is limited to the main towns and villages of the Fann Mountains. Outside of these the only option is to wild camp. You’ll find hotels in Panjakent, mountaineering camps at Alplager Artuch and Vertical Alauddin, and homestays sprinkled throughout villages. Some of these you can book in advance through booking.com, others it’s best to organise via the ZTDA. It’s also possible to just show up, however a bit of advance warning is appreciated and will guarantee your bed for the night. Homestays are a basic affair and usually include dinner and breakfast. You’ll be sleeping on the floor, on a padded mat, in a private room within the family home. Toilet facilities are basic and likely separate to the main house. Staying at a homestay is a great experience and worth trying out at least once on your trek. Prices range from around $10-$20 per person, including meals. 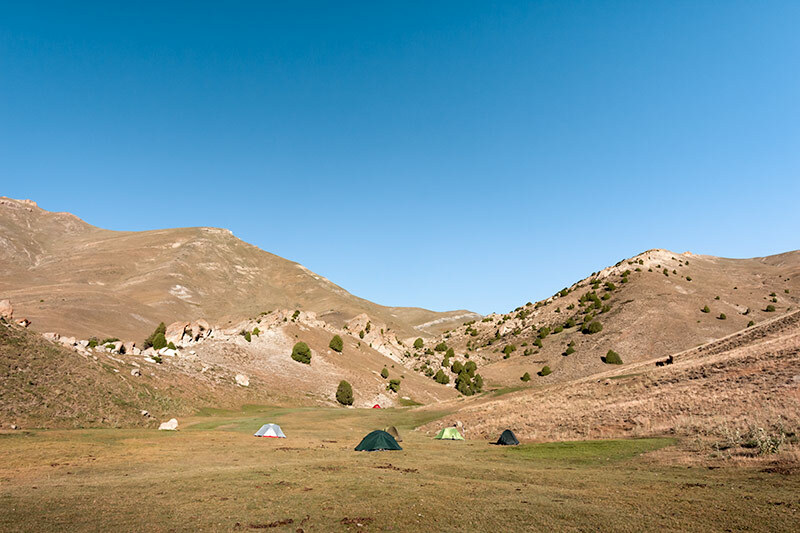 You can camp for a fee at Alplager Artuch, Vertical Alauddin, Iskanderkul Campsite and Iskanderkul Turbaza. Facilities are pretty basic at all of these. Otherwise, wild camping is free and comes with the best views! Be sure to follow the Leave No Trace principles when wild camping. Carry out all your rubbish (or burn it if safe to do so), don’t pollute water sources with shampoo or soap, and bury your human waste. There isn’t one jumping off point for the whole of the Fann Mountains. Your destination will depend on the trek you plan to undertake. The start and end point of each trek in this guide is clearly marked, making it easy for you to figure out where you need to get to. There is no public transport system in Tajikistan. Public buses or trains are not an option. Instead, a network of shared taxis and minibuses (known as marshrutkas) operate throughout the country. These are relatively cheap, but you can find yourself waiting hours sometimes for the vehicle to fill up with passengers before it will depart. Private transport is a more efficient way to travel, but is also more expensive. Ask at your accommodation for help arranging a private car or 4×4 to any of the start/end points of the treks in this guide. Prices for private transport are usually quoted for the entire vehicle, not per person, so sharing with fellow travellers is a good idea if you want to keep costs down. Ask around at your accommodation or on the Caravanistan forum to find travel buddies. 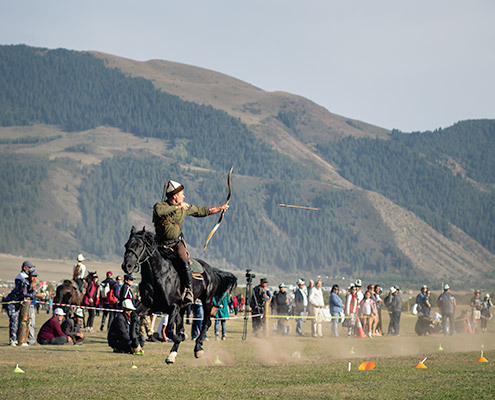 Alauddin and Kulikalon are situated in the northern region of the Fann Mountains. Alauddin is accessed from Vertical Alauddin camp via Sarvoda, and Kulikalon is accessed from Artuch. Artuch is the closest village to Kulikalon, but road access also extends to the old Russian climber’s camp commonly known as Alplager Artuch. The closest big town is Panjakent. You can get here from Dushanbe or Khujand. You can also get here from Samarkand in Uzbekistan, a little over 70 km away to the west. If you’re relying on shared taxis or marshrutkas, you’ll first need to get to Panjakent, then on to Artuch/Alplager from there. Shared taxis run to Panjakent from Dushanbe daily in the morning, from a station in the north of the city (it’s marked on Maps.me, or ask your accommodation to point it out on a map for you). The drive takes around 4-5 hours, costing approx 130-140 TJS p/p. A Marshrutka is around 70 TJS p/p. From Panjakent to Artuch a shared taxi or marshrutka is approx 50-60 TJS p/p. Note that departure times are not set and you may need to overnight in Panjakent before you can get shared transport on to Artuch. If you arrange private transport from Dushanbe or elsewhere, you should be able to organise a vehicle to take you all the way to Artuch, eliminating the need to overnight in Panjakent. 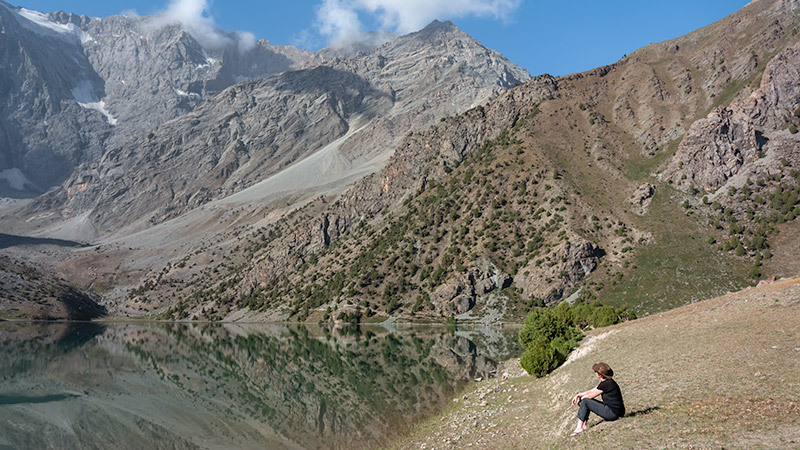 To reach Alauddin Lake you first need to get to a Russian climber’s camp known as Vertical Alauddin. It’s located 2 km or so north of Alauddin Lake and is accessible by a rough road from Sarvoda, on the main road between Dushanbe and Panjakent. 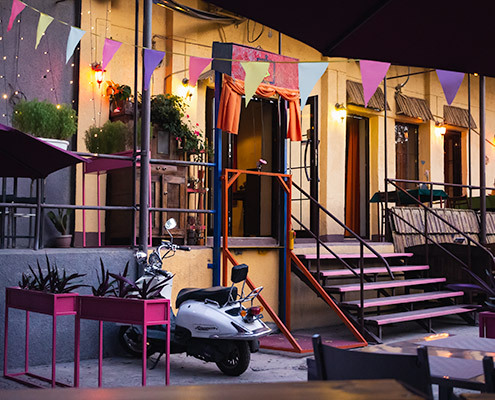 If you’re travelling by shared transport you should get out at Sarvoda and change here. Shared transport options from Sarvoda to Vertical are limited though, so you may have to pay for a private vehicle to take you this last section. It’s a journey of approx 2 hours on pretty rough roads. If you arrange a private vehicle from Dushanbe, or elsewhere, you can request to travel all the way to Vertical. Note that this may still involve changing vehicles in Sarvoda, as a 4×4 is required for the last section. A shared taxi from Dushanbe to Sarvoda is approx 120 TJS p/p. We paid 400 TJS for a private 4×4 vehicle between Sarvoda and Vertical. Zimtut lies in the Archamaidan Valley, a little west of Artuch. The closest big town is Panjakent. If you’re planning to finish your trek here, just ask your homestay owner to arrange transport on to Panjakent or elsewhere. From Panjakent you can take shared or private transport back to Dushanbe, etc. 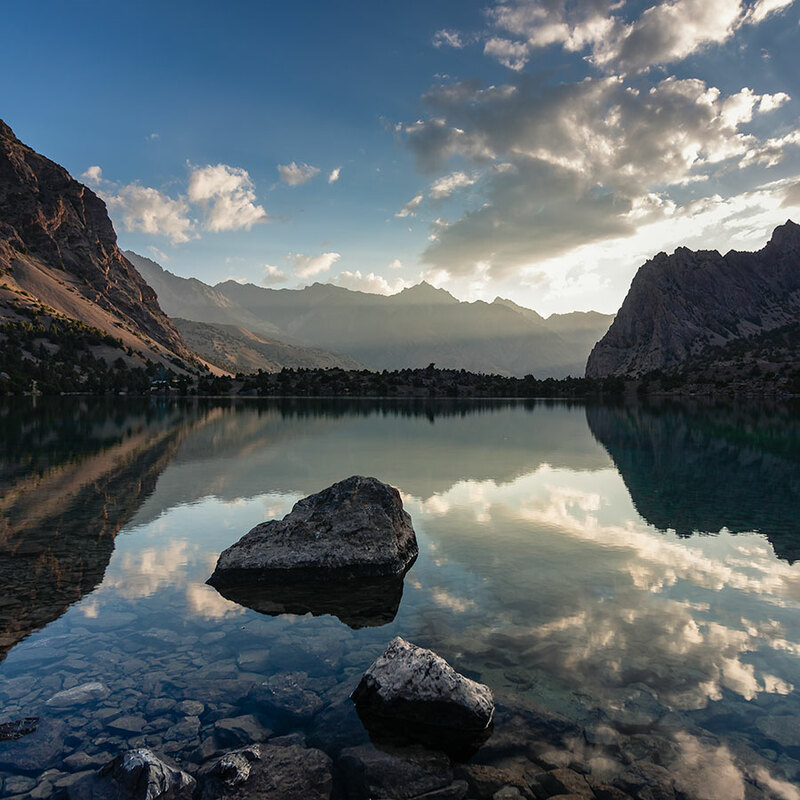 The Haft Kul, or Seven Lakes, are in the west of the Fann Mountains. To reach them by road you need to approach from the north, near Panjakent. If you’re travelling by shared transport you’ll need to get to Panjakent first, as described in the Kulikalon Lakes section above. From here shared taxis and marshrutkas depart for villages in the Haft Kul. 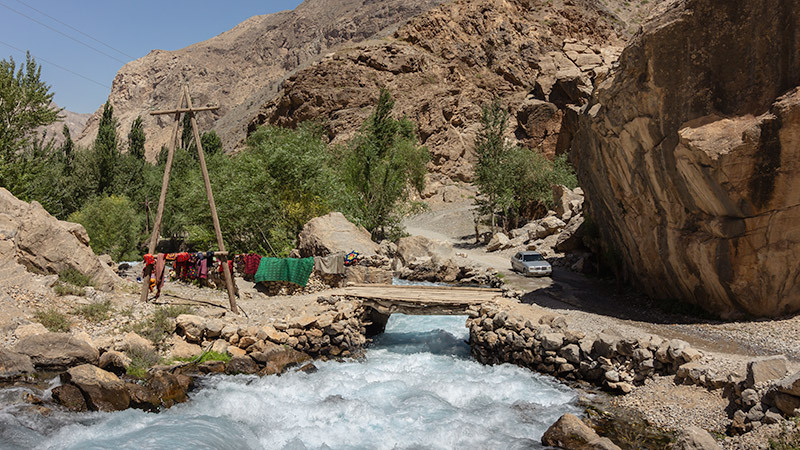 You may need to overnight in Panjakent before continuing to the Haft Kul depending on availability of shared transport in the afternoon. 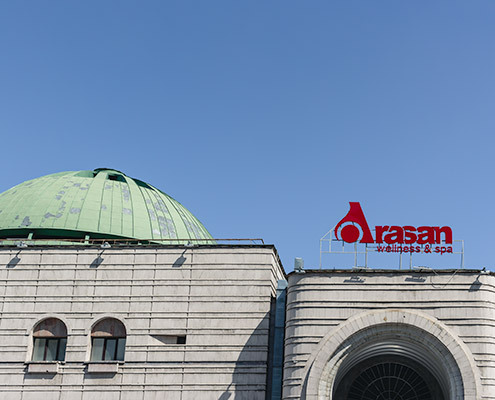 It should cost around 15 TJS p/p for the Panjakent – Haft Kul section. If you organise private transport, it’s possible to get from Dushanbe to the 6th lake in around 6 hours. You may need to change vehicles, switching to a 4×4 for the last couple of hours from the main road up into the Haft Kul. Our hostel owner in Dushanbe arranged this for us, the total journey from Dushanbe costing 1000 TJS, shared between 4 of us (600 TJS Dushanbe to Panjakent + 400 TJS Panjakent to 6th Lake). Iskanderkul lies in the south-east of the Fanns. To reach it by road there is a turn-off near Sarvoda on the main road between Dushanbe and Panjakent. While shared transport is possible as far as Sarvoda, you may need to organise private transport for the Sarvoda to Iskanderkul/Sarytag section. It takes approx 50 minutes to get from Sarvoda to the north shore of Iskanderkul, longer to reach Sarytag village in the hills south-west of Iskanderkul. 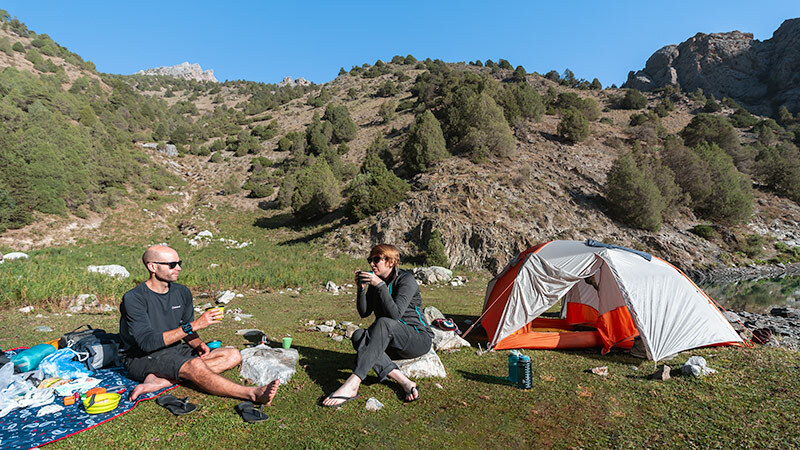 Ask around at the homestays and/or campsites in the area to arrange transport, or at your accommodation in Dushanbe. We arranged a shared taxi from Iskanderkul to Dushanbe for 150 TJS p/p. Most people enter Tajikistan either by land (crossing from Uzbekistan at the recently opened border near Samarkand/Panjakent, or via the Pamir Highway in the north-east of the country), or by flying direct to Dushanbe. Airline options are limited. Your safest bet is flying with Turkish Airlines via Istanbul, Fly Dubai via Dubai, or Air Astana via Almaty. 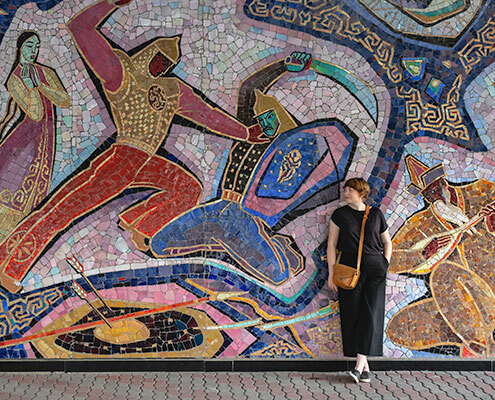 Ensure you check your visa requirements prior to travelling to Tajikistan. Most nationalities are eligible for an e-visa – check here for more info. E-visas cost $50 and allow you 45 days in the country. If you plan on travelling the Pamir Highway also, get the GBAO Permit at the same time ($20 extra). The best trekking map available for the Fann Mountains is the aforementioned EWP Fann Mountains Map and Guide. 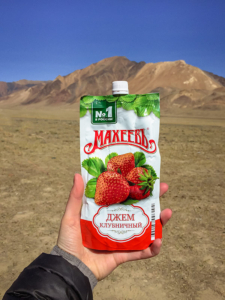 You’ll struggle to find it anywhere in Tajikistan, so be sure to order this from home before your trek. You can get it on Amazon, or direct from the publisher. 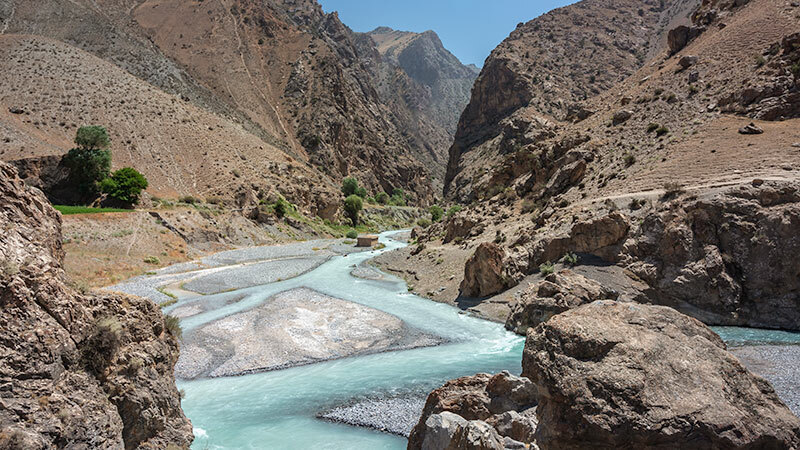 Another useful source is Jan Bakker and Christine Oriol’s book Trekking in Tajikistan: The Northern Ranges, Pamirs and Afghanistan’s Wakhan Corridor. This used to be a self-published PDF book, but is now available in print form. 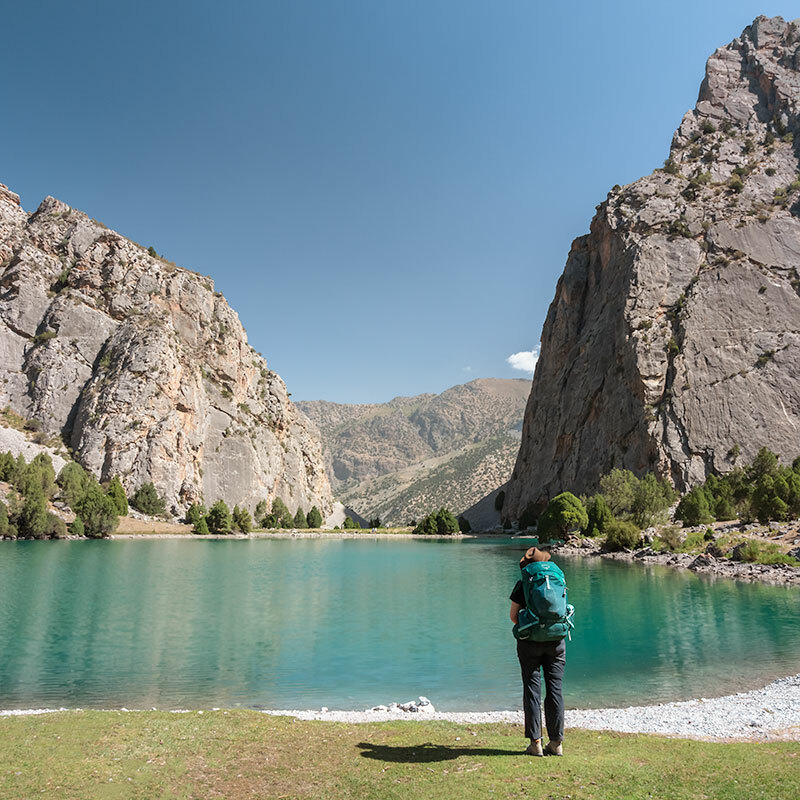 It’s full of useful information about trekking in Tajikistan in general, and covers a few hikes in the Fann Mountains region in detail, including the Dukdon Pass, Kaznok Pass and Lakes Loop. Useful offline mapping sources include Maps.Me (iOS/Android) and Google Maps (iOS/Android). Download the maps for the region while connected to wifi and you’ll be able to access them offline. Google Maps is helpful because it has satellite and terrain view. Maps.Me doesn’t show the terrain but it is really useful as it actually has many of these trails marked on it. You just need to keep zooming in until the dotted line marking the trekking trail appears. You can navigate in real time, an arrow showing your position, making it easy to tell if you’re on the right track or not. This saved us from straying off course a few times. You can also bookmark locations, marking locations for your camp spots, etc. For more general Tajikistan travel information pick up Lonely Planet’s Central Asia guide, or Bradt’s Tajikistan Travel Guide. We hope this guide has helped you move a step closer to your own Fann Mountains trekking adventure. Our first experience trekking in the region was one of the best things we’ve ever done. It certainly won’t be our last time in these magnificent mountains. If you have any questions at all, or maybe even some information we might have missed, let us know in the comments below. I love the way you guys travel! What an informative, comprehensive and thoughtful guide! Thanks Shireen! Hope you make it to Tajikistan soon!